Green energy gets an efficient design. The New York State Energy Research & Development Authority (NYSERDA) is our state's resource for green energy incentives and initiatives. In fact, New York's aggressive clean energy vision is a beacon among states reaching for sustainable energy reform. As Principle UX Director I guided the overall design process, produced and presented all user experience artifacts for the responsive redesign of NYSERDA.NY.Gov. As Art Director I collaborated with a Creative Director and the New York State brand team to create all user experiences and design screens for the sprint 2 / optimization, launched March 2017. NYSERDA had just completed a full website redesign about a year before they hired me to fix it. When a new senior executive was brought on he asked, Why isn't this freshly designed website responsive? Is this dense, technically-worded content right for all of our users? Why does the design already look dated? Rather than spend a year or more on another oversized redesign to fix these problems, he contracted my consultancy for a "quick wins fix." I'm not one to take things at face value. 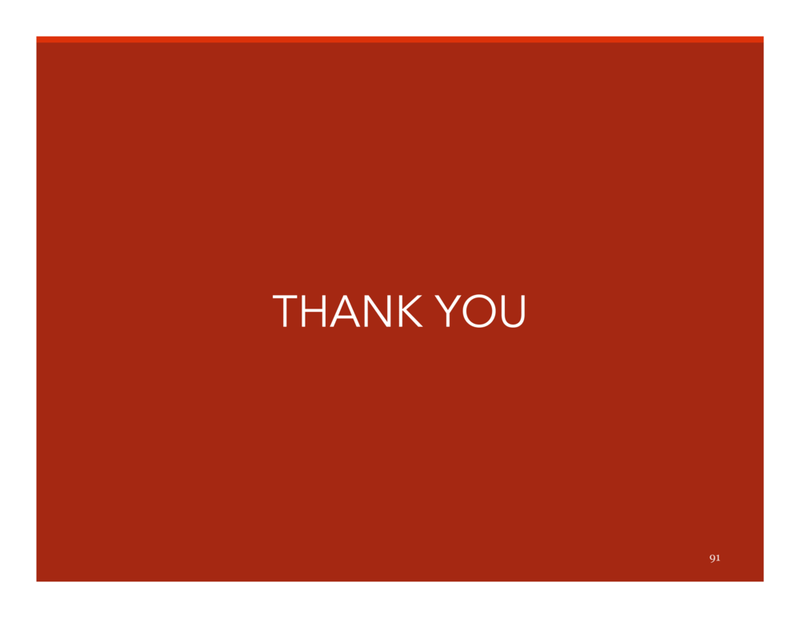 Over a decade of talking to real users about your work will have that effect. 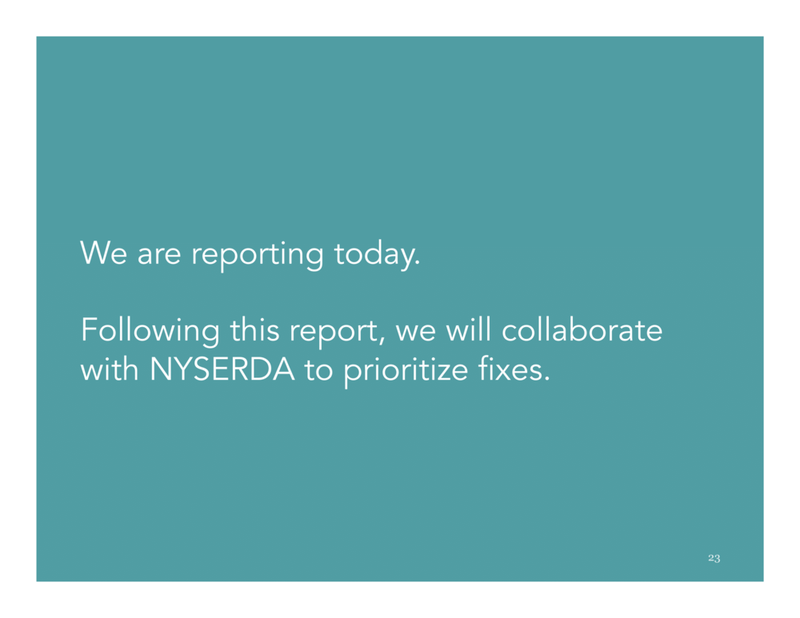 This is why I pushed back on my client's request to fix NYSERDA's live site. Would the needed updates be too extensive to be a retrofit? Suggesting they scrap the live site would be tricky; because doing so meant asking the internal team who worked so hard on the live site to throw away their work. So I looked to their users to make my case. I love to put a blank text box on a survey, asking for users to suggest improvements. Because when 27 out of 61 people volunteer to type, "I can't find what I'm looking for!" you can be pretty sure your information design is a key problem. 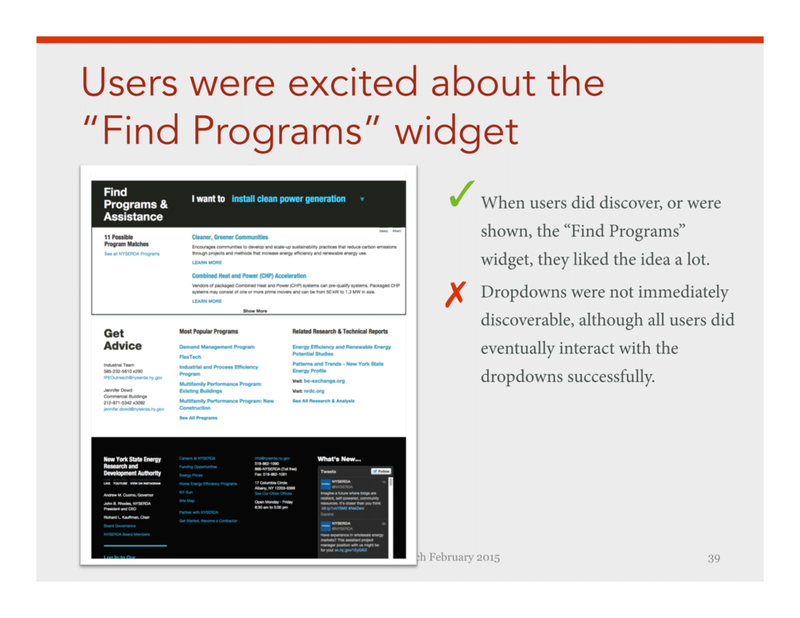 User interviews with 17 participants amplified this message: Improve the website's organization and wording. Sometimes a client has persona fatigue. NYSERDA fell into this category. Having recently completed 12 painstakingly defined personas, they had no appetite for doing personas again. That came in handy for me, because I didn't think personas were the right tool for communicating user needs. Here's why. Most of NYSERDA's website users overlap in terms of demographics—college educated, adults, fairly even split between genders. So a persona with these data points wouldn't elucidate anything for an improved new user experience. What best captures the needs of New Yorkers interested in clean energy? User modes & context. Corporate executives or local leaders who are vetting energy proposals made to them by Influencers (see below). They need proof and reassurance that proposed energy investments will pay off. Researchers and policy makers writing energy proposals aiming to influence Decision Makers. They are energy wonks who need current research and technical details to write solid proposals. Trying to learn about clean energy for their home. They are willing to learn technical terms and do deep research. They need to know they're making the best investments in home energy upgrades to help the environment and maximize energy savings and rebates. Reorganize and simplify NYSERDA's website to help citizens make better energy choices and contribute to New York’s energy vision. New Yorkers interested in clean energy, needed help finding and understanding NYSERDA's programs and initiatives. The real UX innovation here was simply doing the hard work organize their content and design. My client knew what was needed, but needed someone to guide them through the how. Getting a rebate for your ENERGY STAR dishwasher is a world away from approving a budget for hydrogen fuel cells in a hospital complex. So first thing, I sketched a new audience-based navigation that recognized the differences in our visitors' context or energy market. 1. 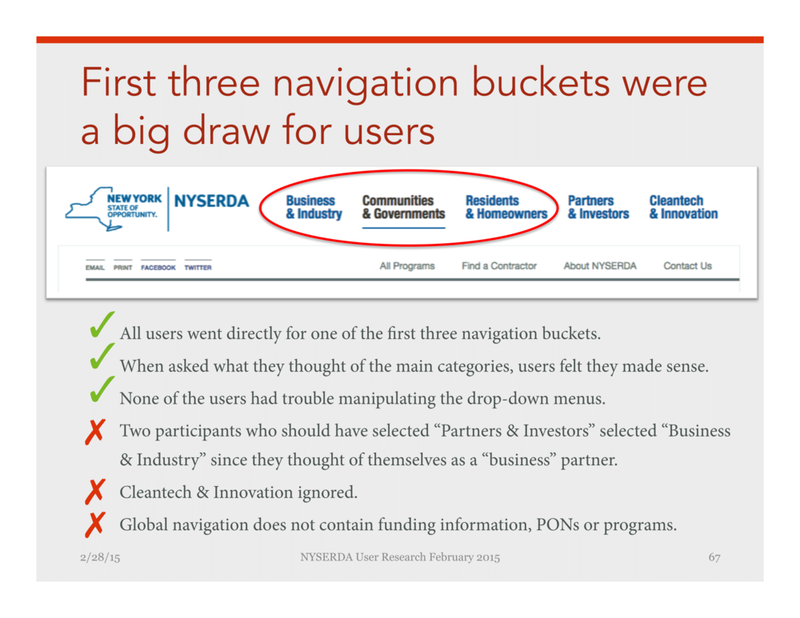 Navigation before my redesign reflects the internal organization of NYSERDA. Once the primary organizing principle was agreed upon, we needed to re-map 2051 pages of content onto the new structure. Before reorganizing things, I wanted to make sure we were only publishing quality content. I led the effort to remove all Redundant/Outdated/Trivial content. With the support of client-side subject matter experts, our ROT analysis reduced the site from 2051 to 1092 pages. That's right. About 47% of the old website content was Redundant, Outdated, or Trivial. No wonder users were getting lost! Fun fact for content strategy nerds: my ROT matrix had 4 lives. ...on which we documented our ROT analysis. The ROT matrix then became our full content map, with good-to-go content mapped to our new information hierarchy. Finally, content gaps were identified on the content plan and became our content production matrix. I ❤ giant spreadsheets. 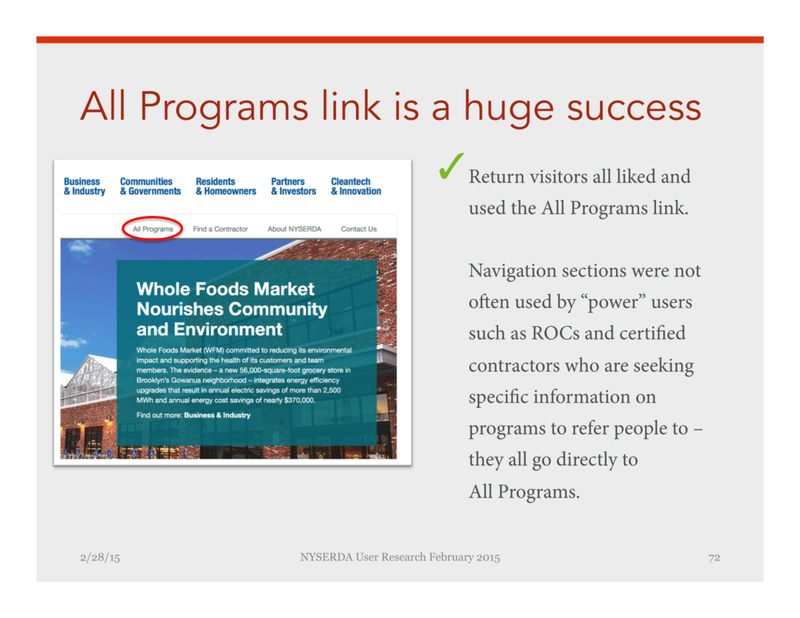 The content mapping matrix was core in reoganizing NYSERDA's 2051 page website. Even after eliminating about half of the site's content, the interface had to work hard to help users narrow down the remaining 1000+ pages. When a user enters the site section for her energy market, she's at the widest part of the information funnel. For bigger markets like Business & Industry sub-markets, like Agriculture or Manufacturing, help the user further narrow down the content. 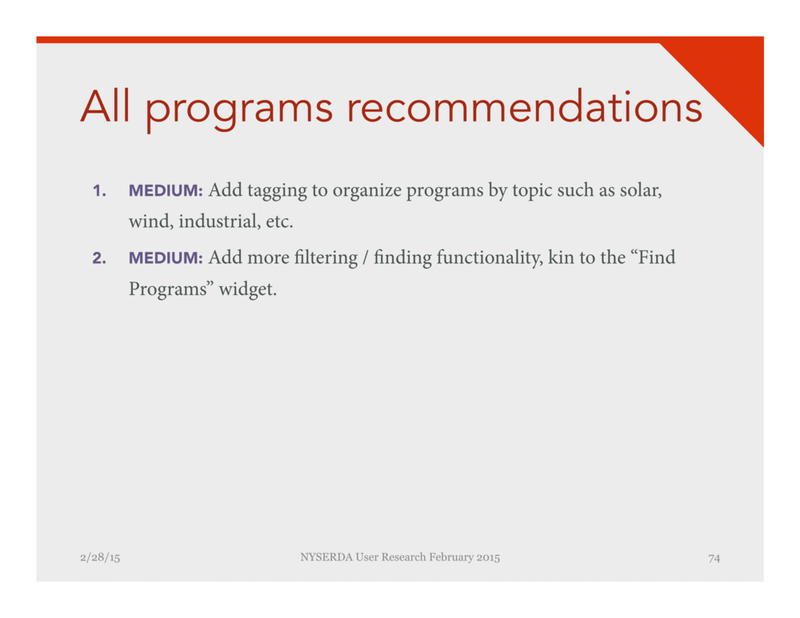 At the same time, general content about each market, or sub-market helps the user discover clean energy incentives and initiatives she may not have known about. It turns out that asking NYSERDA to scrap their live site was not tricky at all. Most users could not find what they work looking for and almost half of the site's content was ROT. The need for a new, new site was clear. If you've ever read the novel Snow Crash, you'll appreciate the quote, "--after that it's just a chase scene." For this part of the case study, I felt like writing, "after that it's just making the thing." It's funny because, just like the chase scene, making the thing really is the climax of the work. But at the same time, you know what comes next. You know how chase scenes go. Our chase scene went like this. I like to test ideas early and often. We started with exploratory interviews and surveys. A few weeks later it was time to test Release 1 with users. I led remote usability tests with an external moderator, Nicole Rubin, to lower any potential bias from moderating my own tests. Below are select screens from the full report. With our user research results in hand, I led my client through a series of workshops to define our Release 2 priorities. Level of effort: how much time would an enhancement or fix take to design, build and maintain? Not too long after Release 1, NY.Gov released a brand book and digital design guidelines for all state entities to follow. I designed the UX and creative for all Release 2 screens, incorporating the new NY.Gov guidelines. Release 2, launched in March 2017 and included navigation updates, new microsite templates and mobile enhancements. Mobile navigation fixes.As of November 2016, the live site was a less than optimal mash-up of the original design and new NYS digital guidelines, seen in the video below. 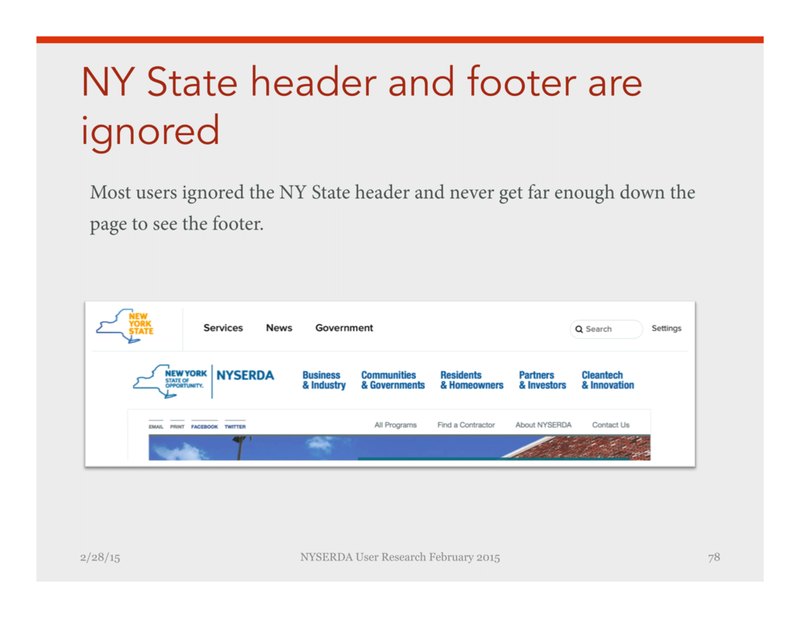 Release 1 Navigation + NY.Gov Guidelines = less than optimal. An updated version simplifies the design language and interaction. Release 2 optimization makes mobile simpler and clearer. 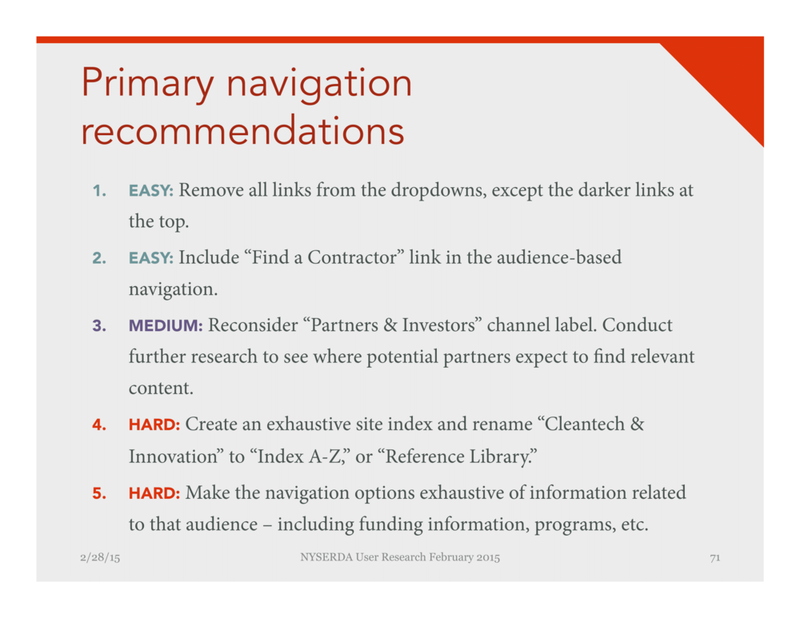 After qualitative testing and optimization, NYSERDA's reorganized site has simplified the path to finding relevant content. Before the redesign, people visiting NYSERDA.NY.Gov got lost endlessly clicking around, trying to find relevant content. Users tried their best to understand dense, jargon-filled program names and content. The re-envisioned site organizes content by energy markets, bringing the user down an information funnel from high level topics in a user-friendly way. Comparing 2013 and 2015, NYSERDA saw 25% increase in content pages viewed within two clicks from the home page. I led a cross-functional team in building vision for how AARP can transform travel for the over-50 crowd.